The Department of Art has announced its lineup of speakers for the Spring 2012 Vincent and Mary Agnes Thursby Distinguished Scholars Lecture Series. This series is devoted to exposing CVATD students to contemporary distinguished figures in the arts. For more information, please call (850) 644-6474 or join the FSU Visiting Artists Series on facebook. This series is funded by a generous gift from the late Vincent and Mary Agnes Thursby. Banner Image: Joe Forkan, Oath of the Horatii (detail). 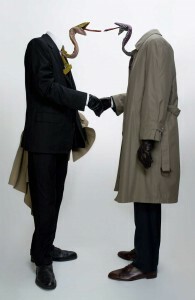 Image Right: Guerra De La Paz, Sealing the Deal (2009).